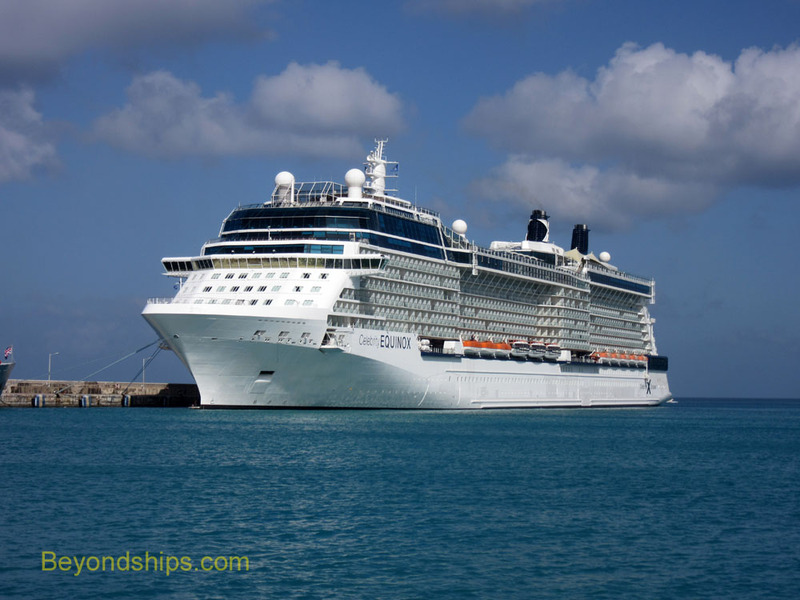 This cruise on Celebrity Equinox was Celebrity Cruises at its best and we mean that as high praise. In our view, Celebrity consistently delivers a high quality cruise experience. So it means a lot to say that a ship excelled at delivering the Celebrity experience. Equinox delivered this experience with a flourish. We were not really expecting Equinox to do so well. She is the second ship built of Celebrity's five Solstice class ships. When people talk about the Solstice class, they usually talk about the younger sisters - - Reflection, Silhouette or Eclipse. But we found that Equinox is not behind her sisters in any way. Equinox is a beautiful modern ship. When the Solstice class ships first appeared in 2008, they had a very up-to-the-minute appearance. Over time, things that once were very much of the moment when they were created can become almost embarrassingly passe. Equinox had been in service for more than five years.. Yet, we were pleased to find that the interior public areas of the ship do not look dated. The décor is still in line with the style being used on the latest cruise ships coming out of the shipyard (e.g. Quantum of the Seas, Norwegian Getaway). The ship has also held up well in use. The ship does not look tired. In part this is due to the refit the ship underwent in 2014 but it is also due to the ongoing attention the crew has given the ship over her service life. Celebrity usually gets high marks for service. On Equinox, the crew seemed genuinely happy and interested in their work. Crew members not only smiled a lot but went out of the way to do things for the guests. As of this writing, Equinox has two main dining rooms. If you are in one of the Aqua class staterooms, you dine in Blu. Everybody else dines in the Silhouette Restaurant. On this cruise, our dining room was the Silhouette Restaurant. It is a large, visually impressive room. The lower level is devoted to the traditional dining system where you are assigned to a specific table at one of two seatings. The balcony follows a flexible dining system where you can come whenever the dining room is open. You have a different table each night but the same waiters ended up serving us several times. Consequently, we had the benefit of getting to know the servers and they got to know our likes and dislikes. A really nice thing about flexible dining is that you can meet a lot of different people. When the maitre d' at the door asks whether you would like to share a table, say yes. You are then seated at a large table and you get to meet new people. Equinox tends to attract intelligent, well-educated passengers and so the conversation is usually good. You do not have to eat in one of the specialty restaurants to have a good meal on Equinox. We found the food in the main dining room quite good. Our only real complaint about the food was that three popular dishes - - Beef Wellington, Duck ala Orange and lobster - - were all on the menu for same evening. The waiters are happy to bring more than one entree but it would have been better to have them spread out over several evenings. While you do not have to go to the specialty restaurants in order to have a good meal, Equinox has some good specialty restaurants that make for a memorable dining experience. In fact, we think the Murano Restaurant is one of the best specialty restaurants afloat. It is fine dining in the classic European tradition. The service is excellent with many of the dishes prepared or finished table-side. The menu is inspired by French and Mediterranean cuisine. There is nothing that we would not recommend but the Chateaubriand was inspired when we visited this Murano. Murano is a more formal dining experience with multiple courses. Some guests prefer the Tuscan Grille, which is more casual. It is a steakhouse with a menu that combines classic steakhouse items with Italian cuisine. If you go early enough in the evening before it gets dark, Tuscan has nice panoramic views over the wake of the ship. Another dining venue that we enjoyed was the Aquaspa Cafe. This is one of those dining venues where it is easy to get a seat at the beginning of the cruise but hard to find a seat by the end of the cruise. Word of mouth is the culprit. It is a small venue - - just a counter and some tables in the Solarium on Deck 12. The design is entirely functional. However, the floor-to-ceiling windows do provide good views. The Aquaspa is open for breakfast and lunch. It specializes in healthy alternatives. For lunch, it has salads, vegetable dishes, poached fruits and other items. However, the highpoint of the menu is the salmon fillet, which you can have grilled or poached. Each salmon is prepared when it is ordered and so you have to wait a few minutes. However, the wait is worth it. It tastes great. The fact that it is also a healthy dish is just a bonus. We enjoyed the entertainment on Equinox. There is a substantial amount of variety. For example, in the Equinox Theater, the production shows run the gamut from Broadway-style shows to the edgy Equinox the Show with acrobats and flying entertainers in a visually impressive performance (albeit with no discernible plot). The cast is talented. In fact, two of the singers gave a separate show in the theater under the name Megan and Crystal, which was as good as the shows by the visiting entertainers. One thing we did miss was the guest lectures that are usually part of Celebrity's enrichment program. Celebrity has a relationship with the Smithsonian Institute lecture to supply speakers aboard its ships. They speak about the area the ship is sailing in or about topics of general interest. The content is usually formidable. Unfortunately, demand for cabins on this cruise prevented allocating one for a guest speaker. There were some lectures on this cruise. The manager of the iLounge filled the theater with several lectures explaining how to use an iPhone and other Apple products. The ship's officers also gave talks on navigation and maritime topics. Along the same lines, there was a watercolor artist aboard who gave complimentary lessons. The itinerary on this 10 day cruise had a good mix of ports. You had the highly developed cruise ports of St. Thomas and St. Maarten. There also was Barbados - - a developed port but because of its location in the southern part of the Caribbean, one less familiar to U.S. cruisers than some of the more northerly ports. St. Kitts is an up and coming cruise port that is becoming increasingly polished. Then you had Dominica, which is a developing cruise port that is quite scenic in the manner of St. Lucia and Martinique. The weather on this cruise was quite good and so it did not put Equinox's seakeeping abilities to the test. However, we have always been impressed by the design of Equinox's bow, which allows her to cut through waves rather than bounce over them. In addition we like the fact that Equinox is capable of running at over 25 knots. Speed is a safety factor. Moreover, it is kind of cool.